Time spent on social media per day is increasing and as a result, online buying is increasing. On average we now spend around 2hours 15minutes per day on social media and 28% of internet users use social media to research and find products to buy. Our buying patterns are evolving and this is good news for many brands as commerce and social activities are taking place in the same space. 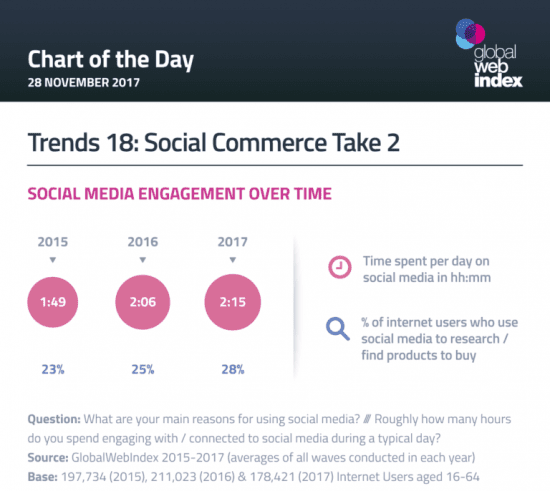 Social commerce is taking off and according to Global web index 'as 2017 draws to a close, two converging trends could lay the groundwork for social commerce to re-enter the stage: changing consumer mindsets and evolving social engagement patterns'.